I looked around for inspiration, and knew I had found it when I came upon a cute, mini mug of cocoa~ marshmallow pop (post coming soon)! This cake is on the other end of the spectrum...a large cup of cocoa~ cake! 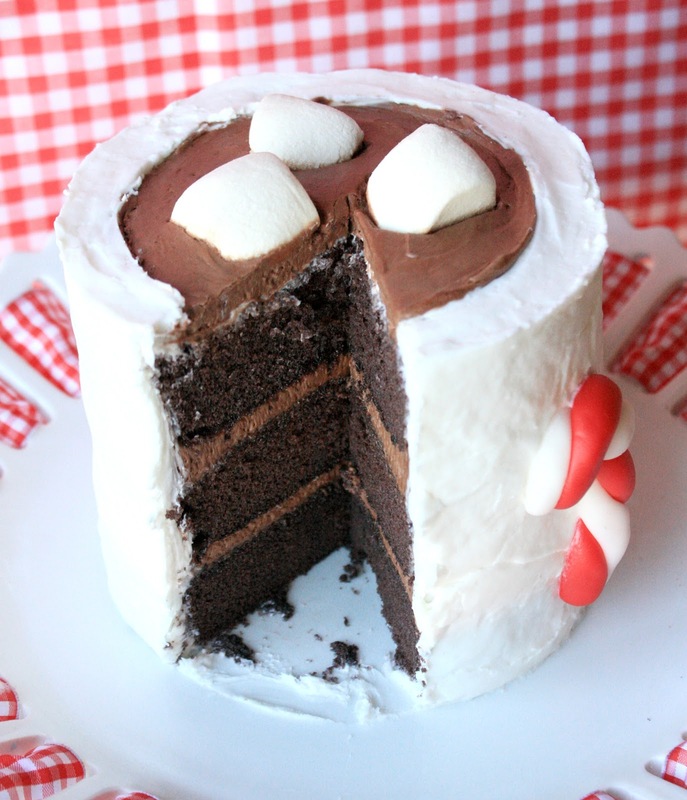 It is made up of three, 5-inch layers of chocolate cake, so it is a relatively small cake. I had meant to cover the whole cake with fondant, but chickened out changed to buttercream instead. The three layers were iced with chocolate buttercream, and then I covered the entire cake with white buttercream. I recessed a round portion of the top by placing a round cookie cutter on top and imprinting. The white buttercream was removed from that area and replaced with chocolate buttercream. The candy cane is made of homemade marshmallow fondant (my first attempt! ), which I was happy with. I made two small ropes, mixed one portion well with red food coloring, and then twisted and shaped them together to form a candy cane. It was pressed firmly into the cake. I did not have the same luck with the mug handle (didn't have enough time for it to firm up and hold its shape), so ended up cutting a piece out of a mega marshmallow and pushing it into the side of the cake. Lastly, I topped the "cocoa" with cut-up regular size marshmallows. I'm ready for hot chocolate season, are you? Thanks so much, Kathia and Melissa! 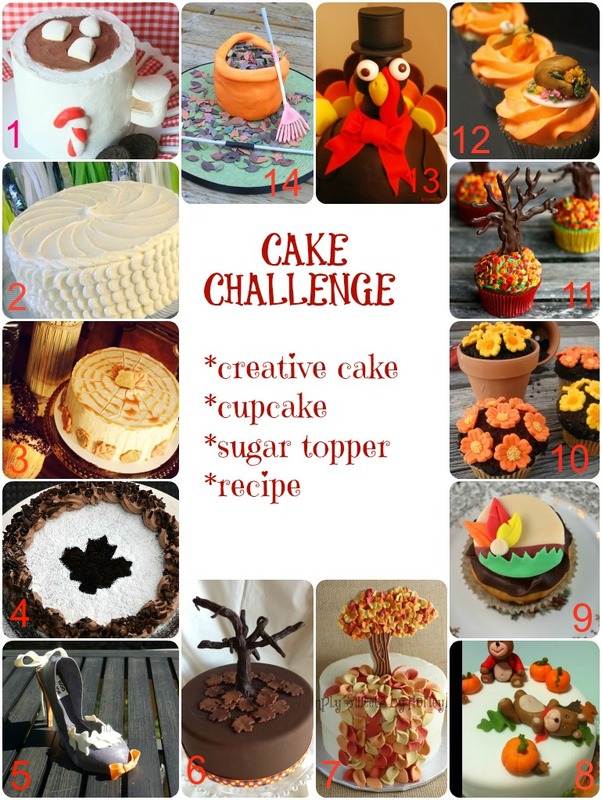 To see what I mean about cake talent, be sure to visit all of these fabulous blogs! that is absolutely amazing! im seriously impressed. all your stuff is so great though! come by and link that over at an aloha affair! show it off. Very very cute cake!! It was fun being part of this cake project with you! I have admired your work for so long, Sue! Thank you so much for doing this with us. And oh my gosh! Love this cake. Every year for my birthday my husband makes me a cake...I just may give him the challenge of making this one! I love it! Fal themed or not, this is absolutely adorable. I'm totally in love with this cake! The handle, the candy cane, the marshmallows, I love it all! I'm a bit of a fondant-phobe myself :) I only pull it out for special occasions! That is the cutest cake I've ever seen :) Love it! This cake is so cute and makes me think of winter nights with a good book and a cup of cocoa. Super adorable and I'm SO ready for it to be chilly and wanting hot cocoa. I think later today when it is raining it will be appropriate! Great job Sue! I heart this cake... very creative! This is amazing...love it! Have to share! Good job! I love the idea! Such a cute idea and the chocolate cake looks so moist and delicious! I love that its kinda Christmas-y because honestly that's all I can think about at this time of year! You know how much I love cocoa mugs and marshmallows. This is so, so cute. And you are a GREAT cake decorator. A quilt judge I know says that she first looks to see if the quilt is an eye catcher and technique comes later. You made an eye catcher. It is just adorable and the cake looks so moist. I am going to have to try this one! I have to admit that I think it will have tasted much better with the buttercream than the fondant so you made the right choice. It is snowing like crazy today and would be perfect as I am craving a hot cocoa. Oh. My. Gosh. Beyond adorable! So stinkin' cute!! Now I really want a mug of cocoa and a slice of this cake!! How adorable! I'll take a big slice, please! What a fun cake - and the inside is to die for!!! I want a great big and I mean BIG slice!! Amazing!!! Your cake is so cute. And perfect for the fall! It's cold and definitely hot cocoa season! Great job, Sue! Such a fun cake Sue, you always have such creative ideas! Awesomely cool cake! Wow! I'd love for you to share this at my link party Submarine Sunday. It's open until Friday @ 11:59pm. I hope you'll stop by! What an awesome cake! I love it. 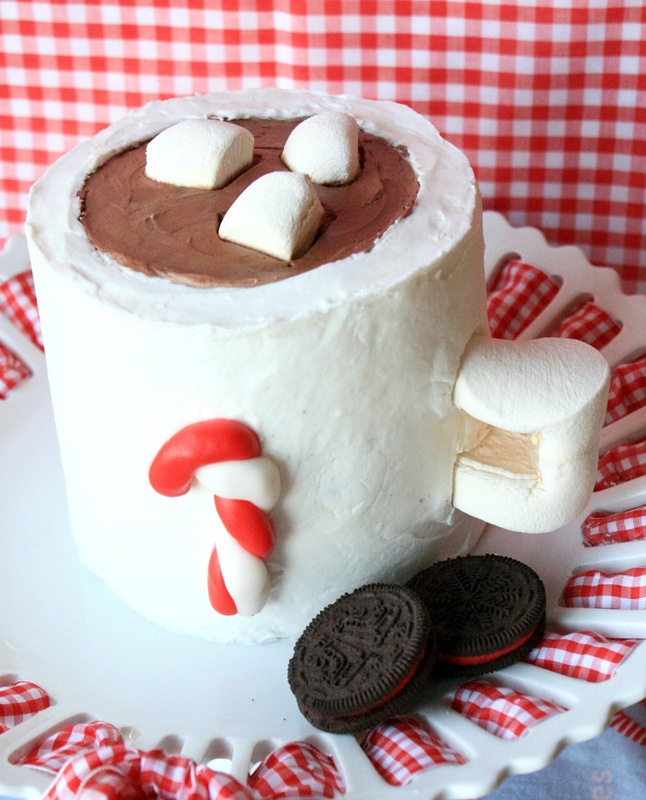 Never mind a real cup of cocoa, I'd curl up by the fire and go through this cake pretty quick. Like a giant cakey version of the pops!! So cute, Sue! Oh my this is just way too darling! Such sweet ideas I always find over here...off to see what other wonderful goodies I have missed. Happy new week. Very cute - and great for a mid-winter pick me up any occasion cake!!! Love the new look of your blog. Your cake just makes me happy! Seriously, you are an artist! The cake looks so adorably delicious. Sue, when it comes to creativity, you really take the cake! I would totally eat that if it were in front of me..
Sue, this is SO adorable! The inside looks so fudgy, I die. You are a 5 stars cake baker and your creativity is simply unbeatable! Wow, that is an impressive cake! Great job. Holy smokes Sue, this is absolutely incredible! Seriously, it really does look like a mug of hot chocolate with marshmallows. I love everything about it. And you thought you weren't a cake whiz too?! Craziness. You've got skills girl! In fact, I started a new weekly link party so if you haven't shared it yet, please do stop by and share on Sugar & Slice Sunday. P.S. The new blog design is awesome! Soooooo pretty and festive. Did you design it all? I saw a picture of this cake over at Butter Sugar Heart and for some reason I knew it was yours. Very sweet indeed. I love this cake Sue, you did a great job. Thank you for participating with us. Your cake is too adorable!!! I had to share it on my page. I hope you don't mind. If you do, just let me know and I will remove my post. Have a blessed day!